Flavor company names are clickable to land on the pages for the best flavors, PG, VG and Nicotine!!! Recipes coming soon, comment on what flavors you would like to see and we will see if we can make them and get recipes up! If you’ve been vaping for a while chances are you’ve thought about making your own eJuice – I know I have! Making your own eJuice can be a lot fun, cost effective, and it’s an experience that can be very rewarding when you accomplish the task of creating a great eJuice you can vape all day and share with your friends. Doing It Yourself is a lot easier than you may think – it requires a handful of simple tools, ingredients, and a bit research. There is a ton of information online to help you get started – so I’ve gone ahead and compiled a list resources and some tips to help you get started on your way to becoming a “Juice Master”! Unflavored Nicotine ::100 mg/ml VG based nic is preferred from here!! You don’t have to use Nicotine, but most vapers do. Nicotine gives your eJuice throat hit, and depending on the level or strength of Nicotine you use the greater your throat hit will be, it also helps with cravings, and makes certain flavours shine brighter. The amount of Nicotine in eJuice is measured in milligrams per millilitre. For example, you might have a 30ml bottle of eJuice with 18mg of Nicotine per ml. Most eJuice comes in the following Nicotine levels: 6mg, 12mg, 18mg, 24mg, and sometimes 36mg. I prefer my eJuice around 12mg – 18mg. You’ll need to play around a bit until you get the level you like. Tip: Most unflavoured Nicotine comes in much higher strengths than the above levels. This is because unflavoured Nicotine is meant to be diluted with VG and/or PG when mixed. It is important to note that undiluted nicotine can be extremely poisonous when absorbed through the skin and you need to take extra precautions when working with it. It is highly recommended that you use lower levels of undiluted Nicotine, around 40mg – 60mg is safe, there is no need to use 100mg Nicotine – you’re going to dilute it anyways to levels greater 36mg! Propylene Glycol (PG) and Vegetable Glycerine (VG) are the ingredients used to dilute Nicotine when mixing eJuice. PG is a very viscous liquid and helps with throat hit, VG is thick and produces a lot of vapour. Most vapers use a 70% PG 30% Vg mix – I prefer a 50/50, it’s all about personal taste. Flavouring is the fun part. This is all about experimentation and trial and error. You can get recipes online to help you get started but you’re going to want to play around to find the flavours that best suit your taste. Capella :::::Some DA and AP free flavors, best in low percentages added to a TFA or FW combination!!!! Flavor West :::::: DA free, check with company on AP free! TFA ::::::This company is upfront on which flavors have DA, AP and which are free of that stuff. It’s important to note that not all flavorings are created equally! You will need to do some experimenting here as well and try the same flavorings from different suppliers. Tip: Not all flavorings can be used for e Juice. Some flavourings are not water soluble or contain ingredients not recommended for vaping. I came across this great great google doc on ECF that many DIY’ers have contributed to that outlines which flavouring to use from the above vendors. Using some very basic tools and a bit of experimentation you can mix these ingredients together to create endless eJuice flavours. You don’t need everything on this list – but it’s a good idea when you’re first starting out until you get the hang of the process – better safe than sorry. Most of these tools can be found through many e-cig vendors and eBay. However, you can also purchase DIY starter kits. I came across the best DIY Ever >>CLICKHERE<<. Believe it or not this is the easy part! Once you have acquired all the ingredients and tools you need to make eJuice – mixing is simple – just follow recipes and experiment a bit. A great way to get started is by using an eJuice calculator. There are a handful online and downloadable apps that help you calculate the percentage of each ingredient needed to produce a specific eJuice. 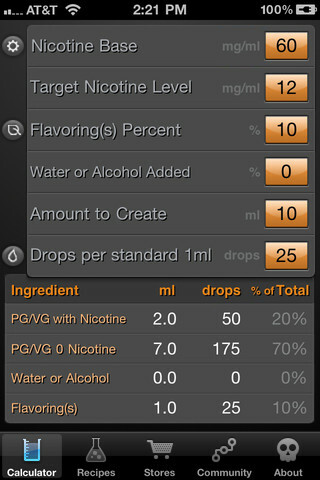 This app allows you to enter all your starting values for your ingredients: Nicotine base, target amount of nicotine, bottle size, etc. Then it gives you the recipe: the amount of each ingredient to mix to get your desired eJuice – all eJuice calculators work pretty much the same. It’s really straight forward – all you have to do is follow the instructions. The experimentation lies with the flavourings. Once you’ve made your first bottle you can vape it – if it needs more flavourings you can add it. Tip: Always start with lower amounts – it’s easy to add ingredients but you can’t take them away! So there you have it – find your ingredients, get your tools, mix it up, shake well, and vape! I know this is a very basic outline, but it is a good starting point and I hope it helps you make a damn good eJuice If you have any questions go ahead and ask them in the comments or if you have any suggestions, feedback, tips, etc add them in the comments as well. Previous PostYoude UD Balrog 70W TC Kit VW Box Mod Black Authentic – See more at: http://www.angelcigs.com/youde-ud-balrog-70w-tc-kit-vw-box-mod-black-authentic.html#sthash.rV4UInbz.dpufNext PostDIY blowout sale 20% off everything!